I hope you all had a fabulous and relaxing weekend! I ran a mile a minute it seems! We had so many things going on at Church yesterday I wasn't home long enough to turn around. It was a good day though! Today I wanted to play along on the Penny Black Saturday Challenge Blog One Year Celebration. The theme was "celebration"... any sort of celebration was fine. I also wanted to try the Monday Technique Lover's Challenge on SCS, which was to make faux handmade paper. We all love those expensive handmade papers, and if we own them, we hoard them... so this was a great way to get the look without the cost! I sponged three colors of Acrylic Paints onto my GPW CS with crumpled up toilet tissue. I didn't worry about little bits of tissue adhering to the paper, because that just adds to the homemade paper effect. After that I used a Metallic shimmery gold and sponged on sparingly. While I loved the look... I didn't stop there. I had to try out my new Shimmerz Spritz that I won on Jami's (Sgt Stamper) blog and just received on Friday. (Thanks so much Jami!!!) I LOVE this stuff!!! It really adds a lot of shimmer to your project and dried quickly! While it's been very cloudy here today, the sun came out for about 5 minutes and I managed to get an ouside shot of this card so you can see more of the shimmer than showed up on my inside shots. The layout is pretty self explanatory. Creamy Caramel is my base and I used a Cuttlebug edge folder for the zig zag pattern, and Swiss Dots for the matted Label #2. The image itself is stamped on 140 lb Aquarello Watercolor paper and watercolored with SU! Markers in Certainly Celery, Creamy Caramel, Pretty in Pink, Bashful Blue and Almost Amethyst. I used a Sizzix Die Cut to cut the balloons and little flower... and I spritzed them with the shimmerz too. The sentiment is from My Sentiments Exactly and is cut with a Nestabilities Tag Trio Die Cut and adhered with some sheer pink ribbon. A little bling and done! I love Penny Black and they are fun images to color. Our Church CARE ministry is asking for more cards, especially for kids and guys... so here is one. So precious Grace!! LOVE your sparkly dp!! This is fabulous, love the faux paper,and those bears are just adorable, and the shimmerz, makes those balloons really stand out. Anyways have a wonderful week! Just adorable Grace, love those sweet little bears! Your coloring and design are lovely. 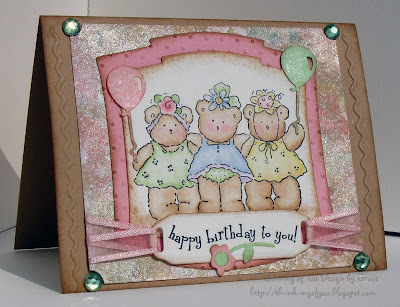 Oh my GRACE they have got to be the sweetest bears....I love your ribbon treatment with the setiment..and your embossed sides..WOW gorgeous card! This is adorable Grace. What a great way to use this technique. So sweet. Hope your time with your dgk is awesome..
Oh this is so gorgeous Grace and your colouring is stunning!!!! This bear image just reeks of fun and you made it come to life with your beautiful selection of colors. This is so cute Grace!! Your coloring with that faux background (which shimmers) is gorgeous!! Great layout. Beautiful as always!! Love the way you used the ribbon. The embossing is great too. Very cute card. Sounds like you had a busy weekend. I love the card! That card is so cute! What a super sweet image, Grace!!! I love your coloring, too, and such great details on this beauty!!!! Such a super cute card - the coloring is fantastic! Totally cute, Grace! I love this card and the one before. The flower soft made wonderful grass! You are just too clever! Awwwwwwww.........this is sooooooooooo sweet!! my nieces would just LOVE this!! thanks for the inspiration!! This is just darling. I like the soft colors and such a darling image.